Bill Russell and Janet Hood’s new musical, receiving its European premiere at Southwark Playhouse, shows women finding their own voices whilst striving to sing in harmony. Unexpected Joy is an infectiously charming romantic comedy about mother-daughter relationships. Three generations of women struggle to escape a man’s shadow. Joy (Janet Fullerlove,) from her late partner Jump, Rachel (Jodie Jacobs) on her husband’s TV evangelism show, while rebellious teen Tamara (Kelly Sweeney, making her professional debut) sneaks out to sing raunchy rock n roll at a Starbucks open-mic out of sight of her pastor father. The mothers and daughters clash with one another as they prepare for Jump’s memorial concert and, in a spirited but terrible bit of scheduling, Joy’s next-day wedding to Lou (Melanie Marshall). As the swaggering butch who offers the grandmother “unexpected joy” in a late-life romance, Marshall steals every scene. Her cutting directness in addressing Rachel’s bigoted ministry and confident one liners are heroic, repeatedly saving the show from sentimentality. There are funny and sympathetic performances from the rest of the cast but the music does not quite match up to the quick-fire, quirky dialogue. 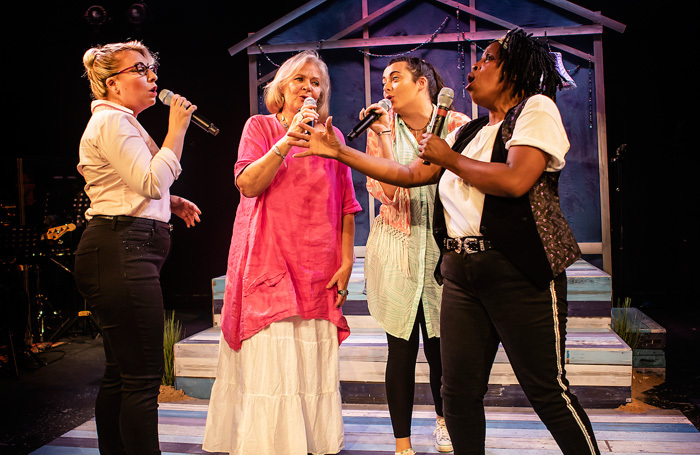 Verity Johnson’s set design does its best to conjure liberal Provincetown in Southwark Playhouse’s smaller studio space but, a bit like some of the vocals, it’s on the wobbly side. Though the characters are well-developed and three dimensional, the stakes are never very high and Amy Anders-Corcoran’s production feels over-stretched. The message of tolerance and family first is warm-hearted but cheesy, the show wearing its politics lightly, like Joy’s sequinned kaftan.